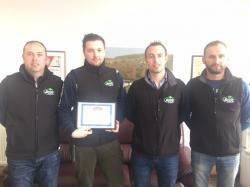 EMPLOYEE RECOGNITION AWARDS: Once again, we had a tough time picking just one winner from each division as the whole team has been excellent at adapting quickly and efficiently to new products and systems this quarter. 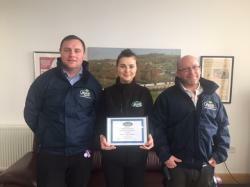 We picked Natalia Grzywacz in the Fruit & Veg Division (pictured here w/ Stephen & Daragh). In the Potato Division, Mantas Vaizmuzis was the winner (pictured L-R: Tommy, Mantas, Philip Jr. & Radek). Congrats winners and well done to the entire team this quarter!